We have seen smart glasses make a presence in the technology world with some flops, but North Focals have been resilient in comparison to competitors. First, it was Google that came out with Google Glass but the build was not as practical. Focals by North are smart glasses that do not look like smart glasses – which is already a great start to the product. There is other technology gear that can be an extension of your phone, like a smartwatch, and the purpose of smart glasses hold the same purpose – fewer phone distractions. Companies want you to focus less on your phone unless necessary and the smart glasses will help you do so. Focals allow you to see notifications, reply to messages, and have access to Alexa while your phone is still in your pocket. Just like normal glasses, Focals are built in a similar manner. They have a black frame but it is a bit thicker than glasses you wear on an everyday basis. If they aren’t a perfect fit, you can get them readjusted to your head to fit you perfectly. The only downfall with that is, you have to do it in person and there are very few locations that do so. Aside from that, Focals don’t cause issues from strangers since there is no camera on the glasses (like Snapchat Spectacles) that make the public feel violated. When you have the smart glasses on, there is a small projector on the inner right arm. This projector beams light onto the lens creating specific wavelengths to let you see the software interface reflected on the lens. For those paying close attention to your glasses, this is one feature that might make the public know you are wearing smart glasses. Another is the thick arms. With the thick arms comes the complication of not being able to fold them down completely. This limits where you are able to store your smart glasses so sticking to the charging box is the best option. You can consider the glasses normal until you get a notification. That is when all the fun happens and you really get to see how the smart glasses work. The interface is not anything dramatic. It is simple and pleasing to look at. Focals work with iOS or Android smartphones and when it comes to the apps, you have complete control over them. So you don’t get overwhelmed with notifications, you can choose and control which notifications you get from specific apps. You also have the ability to see your battery life, the weather, send a text, or order an Uber. When responding to a text, you can only respond directly if using an Android. With iOS, things get a bit more restrictive as you can only reply with “Smart Texts and Emojis”. To get the smart glasses activated to send a text or any other command, you have to do it with the Loop – a separate accessory. 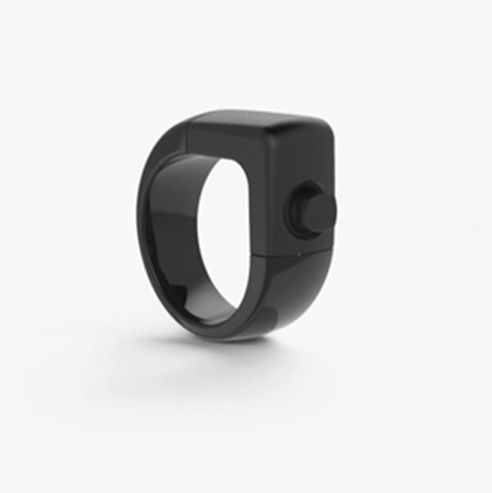 It is a ring with a small joystick that allows you to navigate through different columns in the interface and select apps. It does look a bit nerdy but it still is subtle since your hand can remain close to your pockets. North says Focals can last up to 18 hours with average use. If you notice your glasses dying, they can easily be charged by putting them in the included case. The case itself has the ability to charge the glasses three times. For backup, you can also connect the back of the box through the USB-C port. 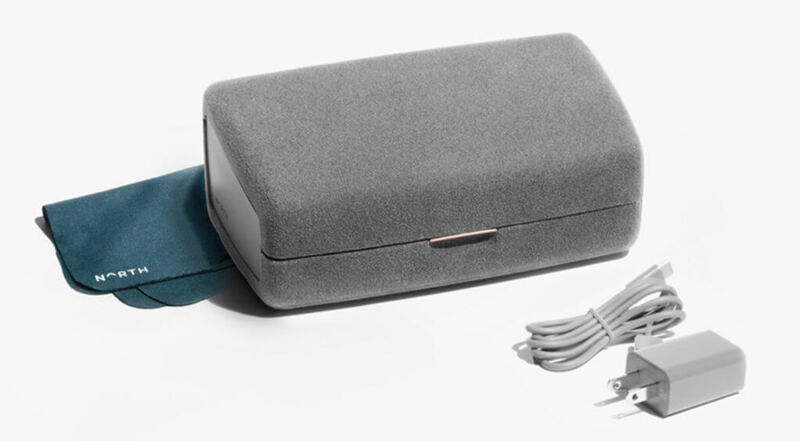 The charging box has a sleek and smooth feel to it which makes a nice accessory. The only thing is that it is bulky and takes up a lot of space. The great thing about Focals is the ability to have them customized to fit your face perfectly. You have to visit a showroom in New York or Toronto to have a 3D scan performed. That’s the thing though – you have to be near these two locations. There are a few mobile pop-ups but you will need to be alert when they show up to a location near you. When having the fitting, the process is simple and quick. Once you get your scan done, you will need to return to pick up the glasses and make sure they fit just right. Smart glasses are like many other phone accessories. It all comes down to if you want it and if you can afford it. Of course, it will help you use your phone less and become less distracted by constantly having to pull your phone out to check for notification. Focals start at $600 and if you want to add a prescription, be ready to add $200 to your final price. It’s a cool gadget to have but not a necessity.